MIDDLETOWN, NJ – Nearly four years after the devastating flood waters of Superstorm Sandy swept over coastal towns across the county, the Monmouth County Board of Chosen Freeholders and Sheriff Shaun Golden today commemorated the high water mark with a sign at the county’s Belford Ferry Terminal. As many as 100 High Water Mark (HWM) signs will be installed in prominent locations within participating municipalities. The signs aim to focus attention on the effects of flood waters in our area. The goal of the program is to ensure the public remains diligent about taking long-term actions to protect themselves, their property and their communities, and brings an added bonus of lowering flood insurance premiums for homeowners. Municipal participation is voluntary and is being offered at no cost to every municipality in the County, regardless of their Community Rating System (CRS) status. Participating municipalities will earn additional CRS program points for greater flood risk awareness, and consequently lower the cost of flood insurance for residents. 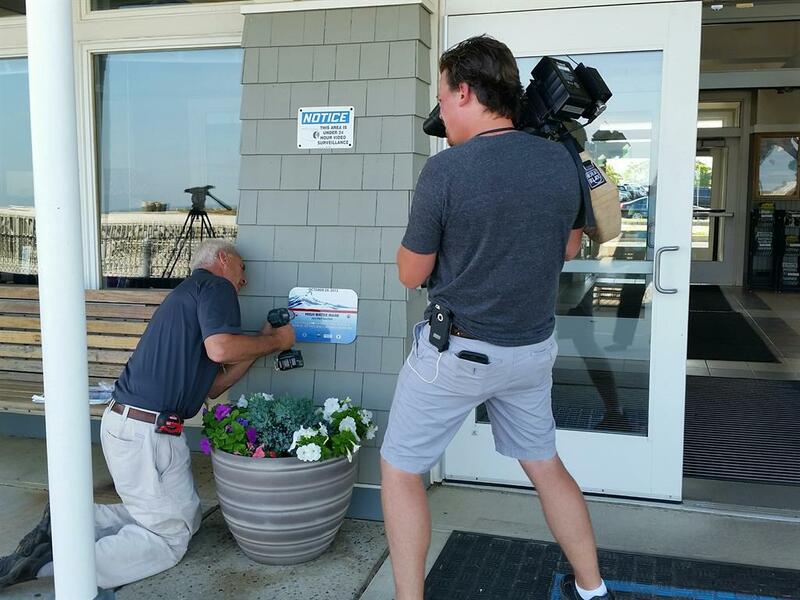 “Fourteen Monmouth County towns have joined the High Water Mark Initiative. These towns have made a commitment to improving their resiliency to future storms and in the process reduced flood insurance premiums for their residents,” said Freeholder Deputy Director Serena DiMaso, liaison to the county’s Office of Emergency Management. The HWM signs are part of a countywide collaboration with the Federal Emergency Management Agency (FEMA), National Flood Insurance Program (NFIP), and its High Water Mark Initiative. The HWM Initiative is a community-based awareness program that sets its sights on increasing local communities’ awareness of flood risk and encourages action to mitigate the risk. As part of the initiative, communities install the signs in designated locations to enhance ongoing educational efforts to build local awareness of flood risk. In addition, towns must take comprehensive measures aimed at strengthening community resilience against future flooding, such as stormwater management projects, and building elevation. The HWM Initiative is being implemented across the county through the County’s Division of Planning, Office of Emergency Management, Monmouth County Board of Chosen Freeholders and Monmouth County Sheriff’s Office, in collaboration with Monmouth University’s Urban Cost Institute which is coordinating efforts and providing additional assistance to communities wishing to participate in the program. Aberdeen, Atlantic Highlands, Avon, Belmar, Hazlet, Keansburg, Manasquan, Middletown, Monmouth Beach, Neptune, Ocean Township, Oceanport, Rumson and Sea Bright are currently participating in the NFIP High Water Mark Initiative, along with Naval Weapons Station Earle and the National Park Service’s Gateway National Recreation Area at Sandy Hook. The Freeholders and Sheriff Golden were joined today by Middletown Mayor Gerald Scharfenberger, Capt. Jay Steingold of Naval Weapons Station Earle, FEMA Region II Administrator Michael Moriarty and Tony MacDonald Director of the Monmouth University Urban Coast Institute to unveil the sign meant to highlight the flood waters that ravaged the area around the ferry terminal. “The Monmouth University Urban Coast Institute and our students are excited to be part of this important program that brings the best available science and public education to coastal communities and will help them make decisions for the future,” said Monmouth University Urban Coast Institute Director Tony MacDonald. 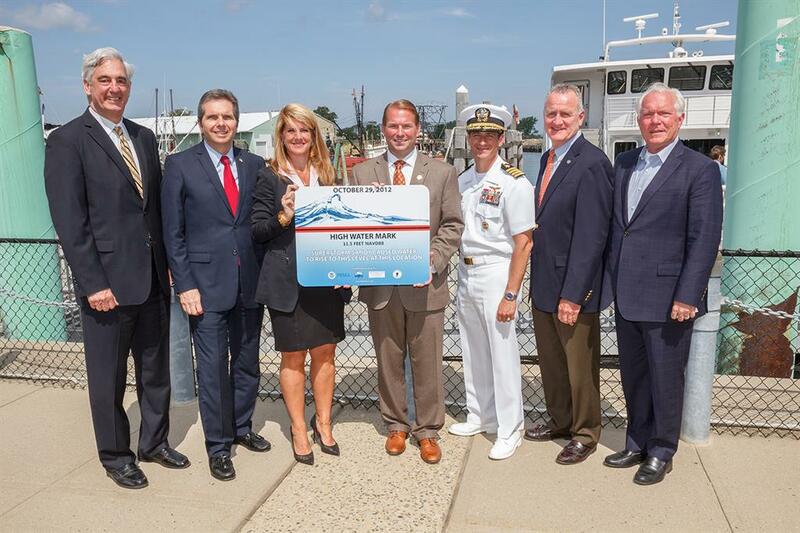 The High Water Mark Initiative is made possible through a partnership with the Monmouth University Urban Coast Institute, New Jersey Sea Grant Consortium, National Park Service, Jacques Cousteau National Estuarine Research Reserve at Rutgers University, Navy Weapons Station Earle, New Jersey Department of Environmental Protection and Verizon. As a participant in the program, FEMA offers limited financial assistance for communities to raise flood risk awareness and conduct mitigation actions to protect the public from future flood events; coordinate to provide a more cohesive message that improves community flood risk awareness and the need for mitigation both locally and throughout the region. The County has developed the signs is working with Monmouth University to identifying locations to be used in each community at their discretion. Any town interested in finding out more about this program is encouraged to contact the Monmouth County Office of Emergency Management at 732-431-7400, ext.1802.